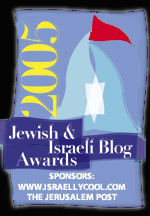 "This is an opportunity we cannot miss"
"Israel today has the chance for peace"
"What we are setting in motion is a final solution"
Hear the echoes over the years, the lies and the liars, the long nightmare of a decade and a half coming to fruition. Peace. Peace in our time. The peace of the bullet and the treaty of the shell writ over a mountain of our own dead. For a decade and a half those dedicated to the expedient course, the traitors of the House of Israel, have told the same lie again and again. Arafat is a man of peace. Abbas is a man of peace. They are all men of peace even as they are killing us. 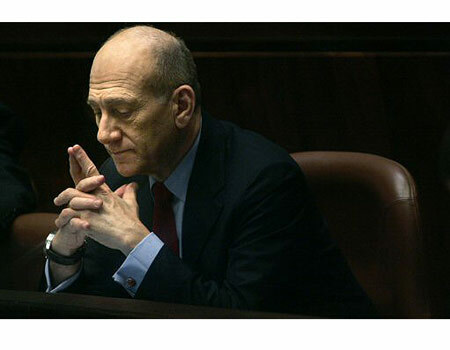 "I am determined to make brave but inevitable decisions that will mean foregoing the full achievement of dreams that fueled our national ethos for years," Olmert proclaims to the Knesset. Yes indeed and so many have bravely made the decision to give away other people's homes and expose other people to shell and mortar. Bravely they have accepted the plaudits from their foreign sponsors. Bravely, oh so bravely they have marched to their award ceremonies while men, women and children have been murdered by the terrorists butchers whose bloody hands clasp theirs. The decisions are inevitable they tell us, don't bother to even protest. It's time to give up on our dreams and accept the reality of the sword at our throat. Time to bow to the oppressor's boot on our neck. While our brave leaders fly bravely to Brussels, we are told to accept the inevitable. "The Palestinian leadership today is not a leadership of terror. President Abu-Mazen and Prime Minister Salem Fayyad are committed to all the agreements signed with Israel, and I believe they want to move forward with us on a track which will change the reality between them and us." Yes merely because they engage in terror, finance terror, preach terror and promise more terror... does not mean that they are a leadership of terror. And we will change the reality between us from our current reality where we are being shelled from Gaza to a new reality where we are being shelled from all across Israel. "The Hamas and Islamic Jihad's murderous attacks from the Gaza border are intolerable... The firing of rockets on the southern communities cannot continue indefinitely... Iran, are making every effort to add fuel to the conflict and threaten the State of Israel with annihilation... kidnapped our soldiers Gilad Shalit, Ehud Goldwasser and Eldad Regev... Knowing all these facts, I still wish to announce here, in the most explicit terms - I have no intention of seeking excuses to avoid a political process." Yes because after all what is the murder of Israelis, the terror campaign against entire towns, the threatened annihilation of the State of Israel and Israeli POW's but "excuses" not to make concessions to the terrorists. And how could such a feeble excuse as the survival of the State of Israel and the lives of its soldiers and citizens stands in the way of that fiery circle of damnation that is the "peace Process". "We can, of course, prolong the process, explaining why all this is not possible, to maneuver, to move in circles, and to use many good arguments... And what will happen if we lose the chance? What will we say if we miss the opportunity?" Yes what will happen if we lose the opportunity to hand over Yerushalayim to the enemy? How will we bewail losing our brief window of opportunity to give the terrorists control of Yehuda and Shomron all the better to shell our towns and cities? How will we live with ourselves if we pass up the chance to negotiate with an enemy willing to promise us peace while continuing to kill us? "The message coming from this house must be clear: this is not a war between good and evil; it is not a conflict between the sons of light and the sons of darkness. What we have here is a necessary debate about the path, a debate that ends with decisions being made, and those decisions bind us all." And that of course is exactly what it is. As Olmert has lied about everything else, it is safe to say that he is lying about this as well. Or to borrow from the Christian lexicon, the greatest trick of the devil was convincing the world that he does not exist. The sons of darkness do indeed sit in the Knesset. They pack the benches. They go off to negotiate with evil and free the murderers of their brethren while imprisoning Jewish girls. The sons of darkness are present and accounted for. Some wears suits and some wear beards. Some style themselves politicians and ministers and rabbis and doctors. Some style themselves right wing and some left wing. But it does not really matter. The sons of darkness stand. Now is the time for the sons of light to stand against them. He is a very bad man or a very stupid man. I was watching Mike Wallace interview Ayn Rand in 1959 interview and looking at the film I noted how uneducated Mike Wallace truly was. All she said to him did a fly by. He didnt "get" it. He couldnt. He was simply not on her level. I think now that many of our world leaders are less than mediocre men with little intelligence and knowledge of history and its implications. I believe their stupidity is very real and that money is their only goal. Low class people of little brain power can see no higher than the money in their pockets. He realizes every thing your post points out. He simply loves money more than he loves Jews or Israel and will do whatever lines his pockets . To these leaders Israel is a place to extort and gouge for money. They are sucking it dry and will leave an empty hulk behind them if they can. They don't care. There's another saying from the Christian NT that might apply here: "Satan often masquerades as an angel of light." This concept was also demonstrated in the movie "The Wizard of Oz." The wicked witch wants to destroy Dorothy and her companions on their journey to the Emerald City, but realizes the method of stopping them must be pleasing to the senses...poppies! The flower that creates opium put's them all to sleep, stopping them dead in their tracks. "What we are setting in motion is a final solution" Was that a Freudian slip on his part? Regardless, people really need to wake up because giving away land to the Palestinians is setting into motion a bloody final solution. I agree, Lemon. Olmert isn't stupid, he's fully aware of what he's doing and it's all about greed and the love of money, which is the root of all evil. 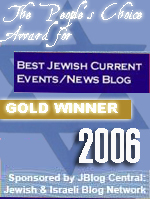 No, Olmert isn't stupid. He's empty, distanced from G-d. What's important to him are the matters of the goyim and being accepted into their circle - even though with one had they dangle the possibility of friendship while the other hand supplies the support for those who will murder Jews. He's like an eighth grade girl who's willing to give up her great, great grandmother's priceless antique pendant for the friendship and acknowledgement of the popular girl in school. The popular girl despises her but she wants the necklace. The end goal is the same. How to make a Jewish State a historical curiousity. The limiting factor is what to do with the nonArab, mostly Jews, people living there. Depending on your attitude is the answer. For the American State Department like people it is how to turn Israel into another South Africa. That way you avoid another Holocaust. Jews become a protect minority. For much of Europe it is that the Jews get whatever they get and any Holocaust will be given a proper minute of silence. For antisemites little need be left to imagine. For Christians, a lot depends on your understanding of their belief. For Muslim what more needs to be said. So you have two basic ideas. One. What is happening in South Africa. Which may be unraveling as we speak. Two. Much of the rest of Africa. The point is that the deep policy even for Israels friends like America is to protect Israel through its transition to an Arab major State. Did not Kissinger back in the early 80s state that America hope is for a small friendly State. Please G-d help us stop this! Send Moshiach ben Dovid now! whom the gods would destroy they first make mad!I feel like we are part of a greek tragedy, we all know the ending it just how we arrive at it.